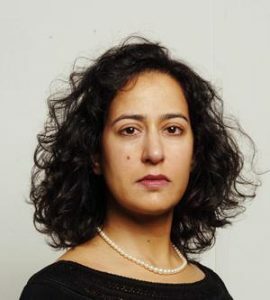 Maya Jaggi is an award-winning cultural journalist, critic and editor who occupies a unique place in British journalism, and has had a transformative influence in the last 25 years in extending the map of international writing today. As one of Britain’s most respected arts journalists, Ms Jaggi writes for The Guardian, Financial Times, The Independent, The Economist and Newsweek, among other publications. She is also an accomplished presenter and broadcaster, contributing to the BBC and featuring on the panel for Radio 4’s Any Questions? Among her impressive list of interviewees are 12 Nobel laureates, including Gunter Grass, Mario Vargas Llosa, Jose Saramago and Toni Morrison, and writers from Chinua Achebe and Umberto Eco to Tom Stoppard. Interviewed by her in 1999, Professor Edward Said praised the resulting profile as ‘in a class of its own’. As important are the less well-known figures she has highlighted, such as Orhan Pamuk (before his Nobel Prize) and WG Sebald. Ms Jaggi is on the judging panels this year of both the Man Asian Literary Prize and the Caine Prize, and has judged past awards including the Orange, Commonwealth Writers, Banipal and David Cohen prizes. She wrote and presented the BBC TV documentary Isabel Allende: The Art of Reinvention, and holds degrees from Oxford University and the London School of Economics.